Activity Boot Camp: Our most popular and fun one day workshop is a great way to re-inspire your repertoire of activities you use in your practice. The focus is on ground work exercises some of which are found in our Ground Activities book. Through the course of the day we will run through at least 10 equine assisted activities including modifications for group, individual work, ability levels, horse considerations and facilitation tips. 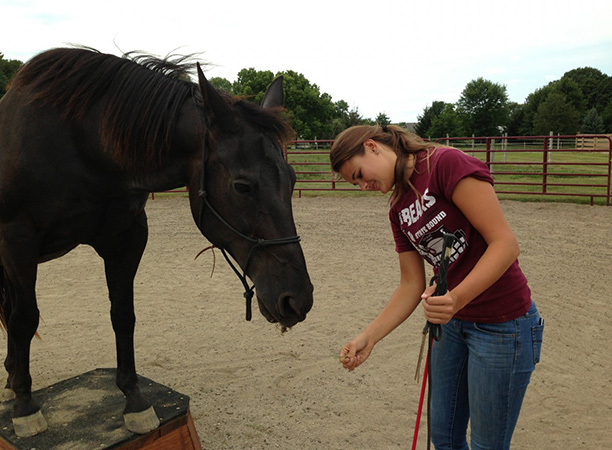 Each activity can be used for both a learning and therapeutic environment so this is a perfect experience for any kind of equine assisted professional from therapeutic riding instructors, counselors, equine specialists and anyone looking for a fun way to learn more about how horses can create change. February 3rd, 2018 Register now! Fundraising Boot Camp: Any seasoned non-profit knows there is no way to teach someone all about fundraising in one day. However, we can certainly cover a lot of ground in 8 hours. We work with you ahead of time so when arrive for the day, you have the leg work done already and we can hit the ground running. This workshop is a perfect time take advantage of more than 40 years of fundraising experience, ask questions and generate a solid plan that you can feel confident about putting into place immediately. We often bring in some of our expert affiliates depending on who we have registered for the workshop so you can maximize your time. We cover tried and true methods that are catered to your specific needs so you can help your organization ensure a more secure future. Offered on request basis only. Social Media Boot Camp: Nowadays it is imperative to have an online presence to keep your program moving forward. In this one day workshop we cover the basic how to’s for setting your organization up with several social media outlets, how to build your online community and how to build a skeleton social media plan for your next event. This is a hands on workshop. We don’t show you how to get signed up, we sign you up so you are up and running before you leave. Even if you have little computer experience we can show you how simple it can be to get started. Offered on request basis only. Want to sign up for a boot camp?